Car Wash Menu - Boost Your Revenue - Lee Soap is a industry leader providing turn-key products and solutions for the Automotive Care, Warewash, Laundry, industrial and janitorial industry. It’s what every car wash owner wants…more revenue! By utilizing proven strategies around effective menu design, packaging, pricing, and signage, you can boost your revenue today. Increase the average amount a customer spends per visit. Typically, this is the easiest way to impact revenue quickly through pricing, menu and offering management, and buy-up promotions. This tactic requires minimal expense to implement and can be easily measured. Increase the frequency of visits your current customers make. Keep current customers returning through loyalty programs and promotions. Success can be measured by identifying your total customer visits per month, annually, and measuring the lifetime value of the customer. Gain new customers. Attract completely new customers to your site. While important to continued growth, gaining new customers is typically an expensive tactic. The old adage, “it costs 20 times more to gain a customer than it does to keep a current customer” is true. Consistent outbound communications is required to make an impact, and can be tough to accurately measure. We’ve gone from being exposed to about 500 ads a day back in the 1980’s (before Social media, etc.) to as many as 5,000 a day today. That’s almost a 700 percent increase over the past 30 years. Grabbing the attention of your customer is becoming more difficult, and we are challenged with finding new ways to sift through the clutter. Nowhere is this more important than on your car wash menu. 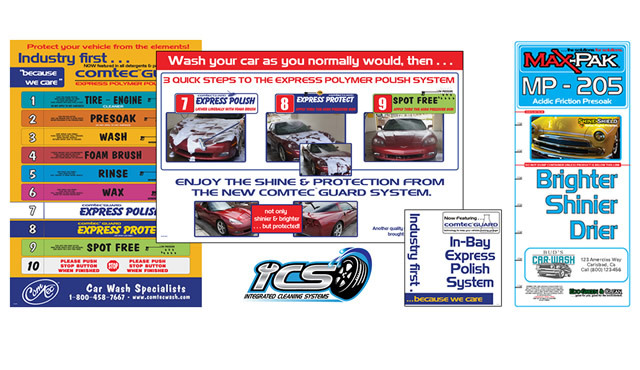 Your car wash menu is a critical tool for increasing your average ticket per wash. Effective menus that are designed to increase revenue have colors and images that attract, are easy to read, and are organized to guide consumers to a specific package. Always place the package you want to have the highest sales where it will be seen first. For most washes, this is your top wash excluding detail services. People read from either left to right or top to bottom, so ordering your wash packages from the best to the most basic in the order that people read will gain better results. For example, in a horizontal menu your best package will be on the left with your basic package on the right. In a vertical menu, your best package will be at the top with your basic package at the bottom. Your best package should also be the most visible. Make it bigger, taking up the most space, and in a bright color so that it stands out. Indicating that it is your best value will help guide customers to this package. Conversely, your lowest-priced package should be your basic wash with no frills. Don’t give more than a basic clean in this package so you can clearly differentiate higher packages. Clearly distinguished wash-package names that emphasize the value will resonate better with consumers and guide them to the best selection. Try descriptive package names that indicate the benefit of each offering. Four or fewer packages on a menu will provide better revenue results. More than four packages can become confusing and cause anxiety with customers. Generally, average ticket for three packages will net better results than four, typically by 5 percent or more. Make sure your wash is using the newest innovative products and industry trends to create high value for your customers. According to the 2014 ICA consumer study, consumers are willing to pay extra for wax/paint protectants and sealants, so offering this provides extra value to your customers. Studies also indicate that consumers prefer to buy brands that they know and trust. Trusted consumer brands in your menu can also create a high value to your customers. A major trend in today’s market focuses on “theater” or show. Exciting colors, scents, and lights will highlight the value received at your wash. Consider a grand entry arch, lighting, high impact chemistry, or other programs that offer consumers a great show and validate the customer’s purchase. Wash packages that promote enhanced protection and shine such as new waxes, protectants, and waxes that can be polished in by friction, create high value and satisfaction for your customers and increase top package sales for you. When done well, a good loyalty program can make you money and can keep customers coming back to only your wash. An unlimited wash program priced from $20 to $50 a month can be very effective. An advantage of an unlimited program is that it allows you to garner a monthly income regardless of weather. To successfully implement this type of program, you’ll need to determine what percentage of your business you want to be part of your unlimited program. Typical redemption rates average from 2.5 to 3.8 times monthly, with 15 percent to 30 percent of overall wash volume coming from a mature loyalty program. Once you determine your target price and mix, you’ll need to aggressively market your program so customers see the offering and value. 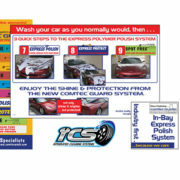 Another effective loyalty program is the clean car guarantee, sometimes called a rainy day guarantee. Typically marketed with top packages, it invites the customer to come back two to five days later to rewash if their car gets dirty. Consumers perceive this as high value; in reality the average redemption rate is around 3 percent. Experiment with new promotions, products, pricing, and offerings for your customers to create new revenue. Programs can be introduced as a limited-time offering. Don’t be afraid of starting with a simple time-bound offer, and determine later if you want to incorporate it long term.